January is official "Bee Season" at Forsyth, with the annual Geography and Spelling Bees for Grades 4–6. 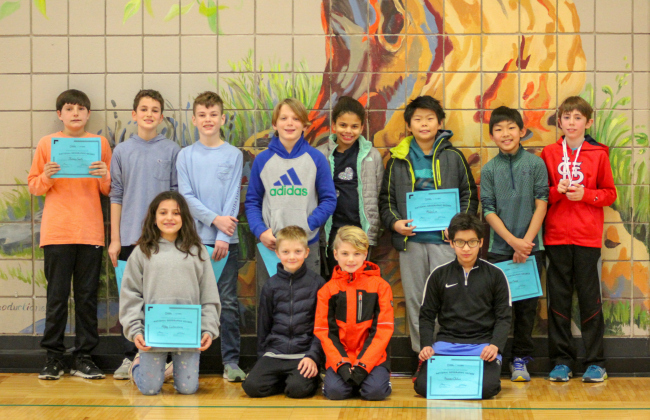 On Friday, January 11, Mrs. Lenzen (Grade 5) facilitated the single-elimination "GeoBee" in Rand Center. The 12 participating finalists had already competed and won at their grade levels. Q: Iceland's largest city is located on Faxaflo, or Faxa Bay, and is heated by hot springs. Name this city. Congratulations to winner Martin (Grade 5), runner-up Thomas (Grade 6), and all 12 participating finalists! Martin will now take an exam to qualify for the state competition. One week later on Friday, January 18, Mr. McGinley (Grade 5) and Mrs. Pillot (Library) facilitated the double-elimination Spelling Bee in Rand Center. After running through all 170 study list words in record time (and approximately 210 words total! ), the winning contestant correctly spelled "wallaby," followed by "tournament" to secure the championship! Congratulations to winner Miles (Grade 4), runner-up Kate (Grade 5), and all 12 participating finalists! Miles will now compete against the best spellers in the St. Louis Metro area at McKendree University in Lebanon, Illinois, on Saturday, March 9.